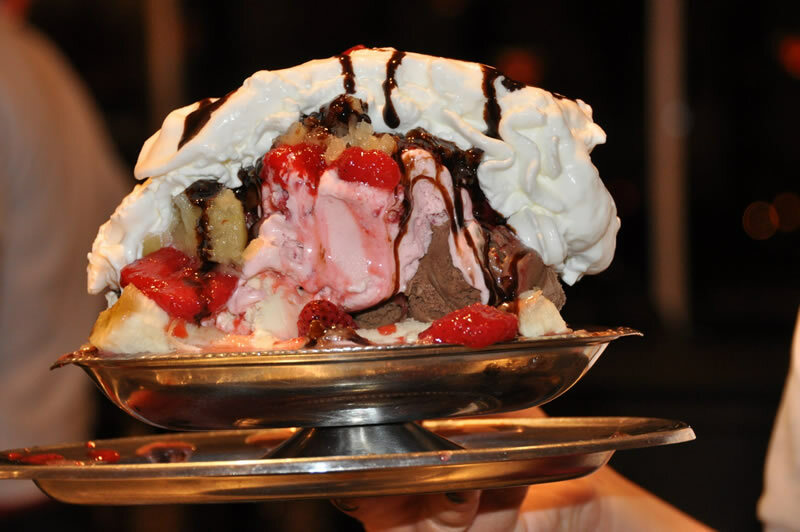 Cabot’s Ice Cream and Restaurant in Newton, Mass., not only offers huge portions of delicious ice cream, but everything else you crave in an ice cream parlor. It’s family-owned and operated and offers good value for the money with food that goes way beyond the typically bland ice cream restaurant fare. The service is consistently good, and the atmosphere fun — and it’s all within a 10-15 minute drive from Boston.. I remember, in the 1970s, my elementary school clarinet teacher, Mr. Drukman, enthusiastically talking about Cabot’s excellent ice cream and great atmosphere. Mr. Drukman was right on key about Cabot’s then and the great news is that this well-known-to-locals ice cream spot hasn’t changed much through the years. Cabot’s, in fact, might have gotten better. Since starting business in the late 1960s, Cabot’s has expanded its ice cream selection to more than 70 flavors and 35 toppings options, as well as gigantic classic and Belgium waffle sundaes, a gargantuan banana split, parfaits, ice cream cakes and pies, and puffs, brownies, and shortcake. Cabot’s also serves a wide variety of floats, frappes, ice cream sodas and frozen yogurt. While the breakfast, lunch and dinner offerings remain intact, Cabot’s has upped the quality while also expanding the menus. You really can’t go wrong here with the omelets, waffles, French toast, pancakes, flame broiled burgers, deli-style sandwiches, homemade soups (they make a great chicken noodle), heaping salads or comfort food dinners like franks and beans, Sheppard’s pie, roast turkey (with giblet gravy, stuffing, cranberry sauce, and potato), mac and cheese, and fish and chips. Most of the dinners are around the $10 mark, and sometimes well under. What a bargain! The ice cream stands out best, however. Unlike some other ice cream restaurants, Cabot’s flavors don’t taste like something you could buy at the supermarket — they have much more in common with local ice cream stands that turn out homemade ice cream. While not quite up to the standard of the very best local ice cream stands like Kimball Farm and Peaceful Meadows, Cabot’s comes close with its rich tasting flavors. I generally regard chocolate, vanilla and black raspberry as the markers for ice cream quality — the first two because of their world-wide appeal and popularity, and the latter as a flavor that, when done right, has that fresh-from-the farm taste more than most other flavors. Cabot’s comes through quite well with all three flavors — further validation that this is premium stuff! What’s more, Cabot’s is open year-round and doesn’t skimp on heating the dining room to a comfortable level during the winter. 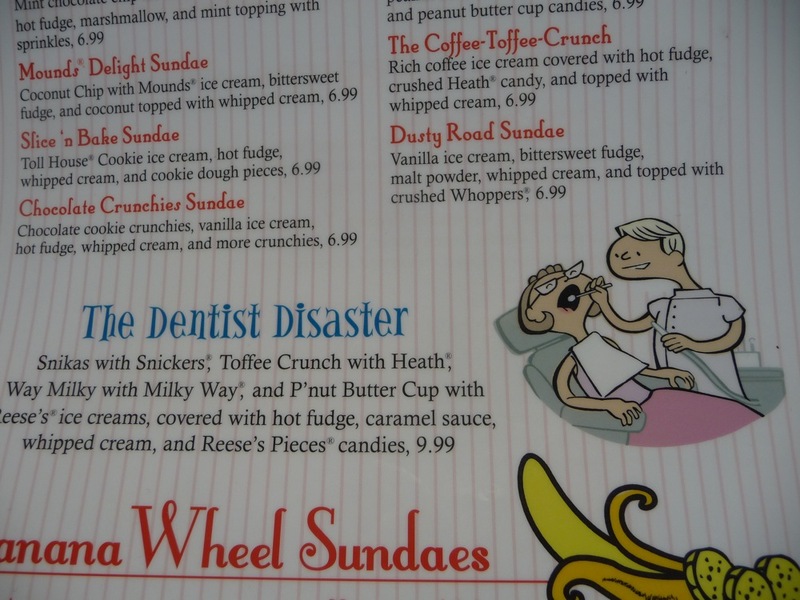 They also exhibit a fine sense of humor with ice cream names like “The Dentist Disaster” sundae with its mix of myriad famous candy bars covered with hot fudge, caramel sauce, whipped cream, Reese’s Pieces candies — and a funny cartoon illustration on the menu. 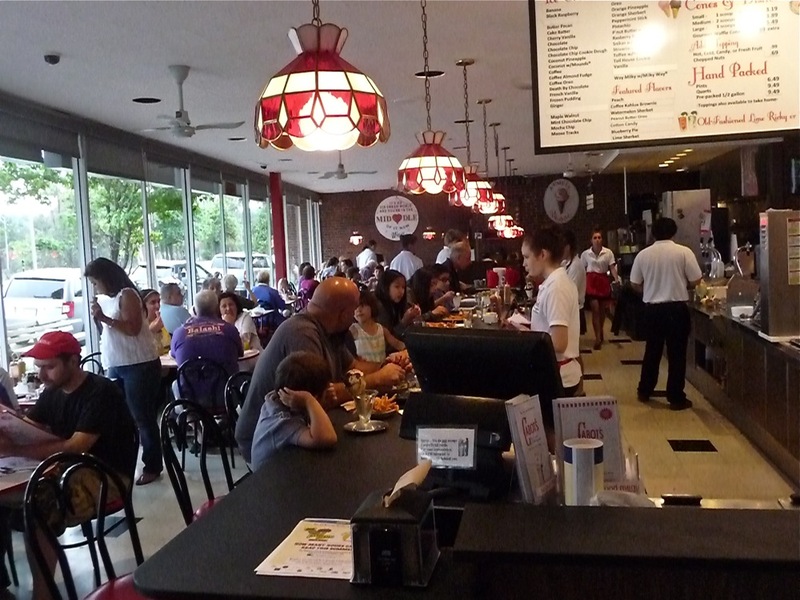 What makes Cabot’s more than a special ice cream treat destination, though, is the atmosphere. With booth and tables, a long counter that evokes the good old-fashioned days of the soda/ice cream fountain, tiled floors, Tiffany-style lamps and a lighted sign with ice cream flavors listed high above, this Newton ice cream restaurant is one of the last old school ice cream parlors in eastern Massachusetts. It’s great that Cabot’s held onto the ice cream parlor model and makes you wonder if similar, now-closed businesses had a little patience and perseverance, they could be drawing the crowds that Cabot’s does today. Often, the lines at Cabot’s are out the door, thus proving, as the old cliche goes, that sometimes the best change is no change at all. Cabot’s Ice Cream and Restaurant is located at 743 Washington St., Newtonville MA. Tel. 617-964-9200. Cabot’s is closed on Mondays.